Are you starting to suspect that you may have a leaky roof? Have you noticed puddles of water indoors or maybe even some water stains on the walls of your commercial building? Hail and other extreme weather cause more than $1 billion in damages each year, and commercial roofs are particularly vulnerable. If you suspect that you have a roof leak, it’s worth looking into before it becomes a major problem. We’ll give you the inside scoop on commercial roof leaks and help you figure out if you’ve got a problem. One of the first signs of a leaking roof is water indoors. You might chalk it up to a minor pipe leak, but roof leaks can turn serious in a matter of a few days. The problem with commercial roof leaks is that they often lead to mold. Once you’ve got mold in your walls, it’s essential to remove it. Another sign of a leaky roof is a strong smell of mold. If you’re using your commercial space for manufacturing, you might not notice the smell right away. If you’ve got a roof leak, you might be able to see it from the outside of your building. You may have shingles falling after a bad windstorm, or you may actually be able to see part of your roof’s protective lining blowing in the breeze. In general, if you think you’ve got a leak, you probably do. Don’t let cut-rate contractors convince you that you’ve only got one leaky pipe if the reality is that you need more work done. Look for contractors who use top-quality building materials and provide warranties. Make sure they’re licensed, bonded, and insured. If you have existing roofing issues, it’s best to contact a commercial roof repair company. However, there are some steps you can take to prevent further damage. First, remove all standing water on your roof. Professionals call this “ponding,” and it’s a major indicator of future problems. You should never have any water soaking into your roof, even after a storm. Ponding water is a primary indication that your roof’s drainage system is coming up short. If you can remove it yourself, go ahead, but it’s recommended to call in the pros. Also, make a note of any ponding that you see inside of your building. Knowing where the leaks are appearing will help your contractors trace their sources. When you talk to your contractor about replacement and repair options, make sure you ask about new “fluid” roofing finishes. They’re made to prevent ponding and can actually lower your heating costs. Fluid roofs have a white finish and are tax deductible for the year you get them installed. They carry warranties of up to 15 years and could be a good long-term solution. A common cause of leaky commercial roofs is the entry point of your HVAC system. Your chimney might also be prone to leaks, especially right where it meets the roof. Before you request help for roof leak repair, see if you can spot the cause. You may not be able to repair it yourself, but you’ll be able to give the contractor more information once they start the project. If you feel any dips in your roof’s surface, make a note of it. These are called “soft spots” and could be an indication of serious damage. You should also make sure that you don’t have any visible mold, lichen, or algae on your roof’s surface. Even if your roof is in good condition, make sure to check your HVAC, gas, and water pipes’ entry points on a regular basis. 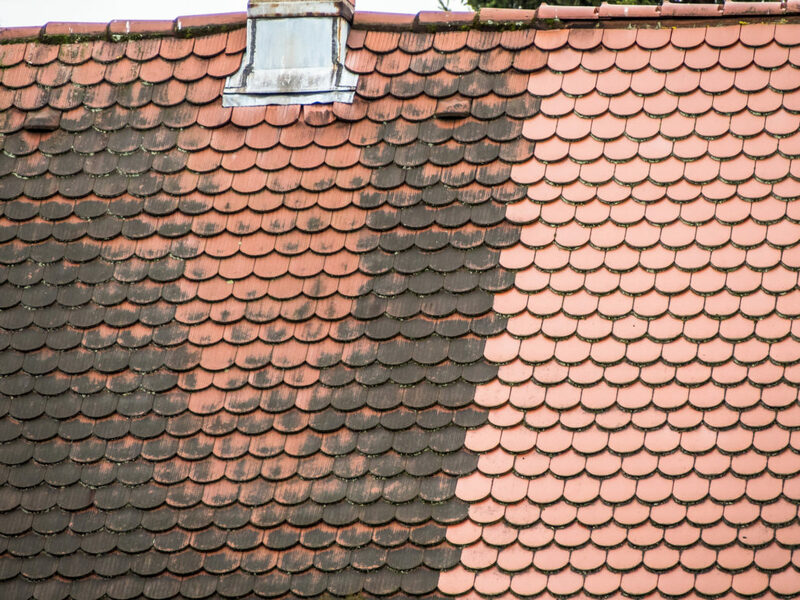 If you’re planning on removing algae from your property’s roof yourself, make sure that you aren’t going to accidentally void the shingles’ warranty. If you know for sure that your roof is leaking, it’s time to call in the pros. But how can you be sure you’re hiring a trustworthy company? First, talk to some of your friends and family and see who they’ve worked with. If you like the work that was done and it’s holding up well, that’s a good first step toward finding a contractor. Another thing to consider with your roofing company is how long they’ve been in business. When you’re wondering how to fix a leaking roof, you need a company that can come in and solve your problems, not create more. Look for a company that has been in business for more than 10 years. The longer they’ve been around, the better. See if you can find customer reviews online and get a sense for how quickly and professionally they complete the work. Recently, construction companies have started to shift to a new method of working. It’s called “design/build,” and it means that you get contractors and architects on the same team. You only have to sign one contract, and the work typically gets completed more quickly. If you’ve got a roof leak that can’t wait, give your contractor a call. Remove any equipment from the area of the leak and don’t let employees into that part of your facility. The best roofing contractors will be able to handle leaky roofing projects at any time of day or night. They will make your business a priority and help you get back to work quickly. Finding a roofing service with a great reputation doesn’t have to be difficult. It’s just a matter of knowing where to start and who to trust. It’s also a matter of getting service that completely solves the problem instead of just delaying it. Our roofing company is in its third generation. We have more than 100 years of combined experience and have installed more than 50 million square feet of roofing for our clients. Take a few minutes and give us a quick call. You can also submit a request online for a free consultation. We’re happy to help and committed to helping you solve your roofing problems. 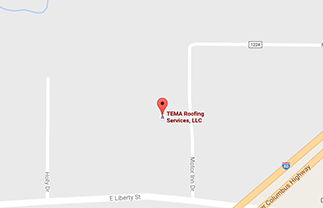 TEMA Roofing Services is a family owned company, spanning three generations and a 50 year history. We offer commercial & industrial services for roofs of all types.